Ambulatory phlebotomy (also known as microphlebectomy) for the removal of varicose veins is a safe and effective outpatient procedure at Chesapeake Vein Center & MedSpa. This procedure is performed under local (awake) anesthesia and is typically completed in as little as 30 minutes or as much as two hours, depending upon the amount of diseased vein tissue present. Extensive procedures are scheduled as outpatient procedures utilizing an operating room or surgical center. Prior to this procedure, board-certified vein specialist, vein doctor and vein surgeon Dr. Surya Challa may employ venous duplex ultrasound technology to access the health of the veins in question. Following the ultrasound portion, the ambulatory phlebotomy is undertaken. This involves small incisions (about 2-3 mm in size) through which a surgical micro-hook removes the varicose vein tissue. Because patients have been numbed with a local anesthesia prior to this minimally invasive surgery, no discomfort is usually experienced. After the diseased varicose veins have been removed, blood is re-routed to healthier, non-varicose veins. Dr. Challa has performed hundreds of these procedures typically with excellent clinical outcomes, a reduced risk of side effects, high patient satisfaction and minimal post-operative discomfort. What conditions does ambulatory phlebotomy treat? Ambulatory phlebctomy (also known as microphlebectomy) is a surgical procedure to remove varicose veins and improve vein health. Varicose veins are often the product of venous insufficiency, also known as venous reflux disease. 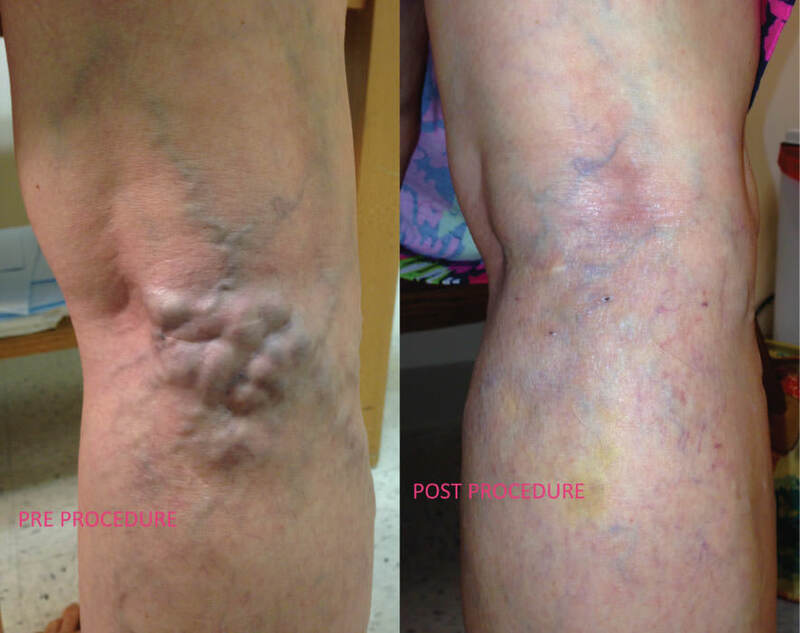 This procedure works by removing varicose veins through small, “micro incisions” in the skin. Because varicose veins are highly collapsible, even severe varicose veins can often be removed through incisions just 2-3 mm in length. The varicose vein or varicose veins are then removed with a tool called a surgical micro-hook, section by section. Is this treatment covered by insurance? Ambulatory phlebotomy is typically covered by insurance, as varicose veins will worsen without treatment and can cause serious health problems if left untreated. Is this an outpatient procedure? Yes, as it is performed under local (awake) anesthesia in-office and does not require sutures or stitches. This procedure can take as little as just 30 minutes. Extensive procedures are scheduled as outpatient procedures utilizing an operating room or surgical center. Because the area is numbed with a local anesthesia prior to varicose vein removal, the vast majority of patients do not experience discomfort. Additional oral sedation is also offered. When can I resume my daily activities? Patients are able to walk immediately following the procedure, returning to work 1-2 days following the procedure. Heavy lifting and vigorous exercise should be avoided for at least 1 week. How many procedures has Dr. Challa performed? Dr. Challa is a very experienced Chesapeake area vein doctor and vein specialist, having performed over 500 ambulatory phlebotomy procedures for the treatment of varicose veins, venous insufficiency, restless leg syndrome and venous disease. What regions does Chesapeake Vein Center & MedSpa serve? Chesapeake Vein Center & MedSpa, located in Chesapeake, VA, is a convenient option for the removal and treatment of varicose veins throughout Norfolk county and the Virginia Beach area. What makes Chesapeake Vein Center and MedSpa different? Dr. Challa rigorously reviews all medical protocols at Chesapeake Vein Center and MedSpa prior to application. An advantage of having a surgeon such as Dr. Challa actively practicing at the same site is the higher standard that medical offices typically adhere to. You can be assured that these practices are safe, effective and tested. Is Dr. Surya Challa actively practicing in Chesapeake, Virginia? Yes! Dr. Challa actively sees and treats patients at Chesapeake Vein Center and MedSpa. This means that our office adheres to a higher standard of care, equal to that of medical offices. Other medical spas are often ‘overseen’ by a medical director, or may be simply ‘associated’ with a medical director; neither of these situations carries any guarantee that the medical director even practices out of that location. Is a hospital stay required? A hospital stay is not required for this procedure.